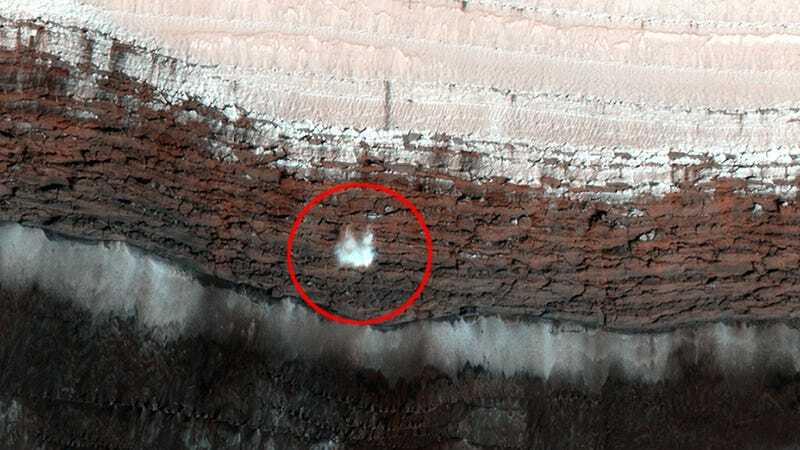 In another reminder that the Red Planet features a complex and active surface, the HiRISE camera aboard the Mars Reconnaissance Orbiter has captured an image of a “dry ice avalanche” streaming down a cliff. The avalanche, which measures about 65 feet (20 meters) across, was spotted on a scarp at the edge of the North Polar layered deposits of Mars. That’s nearly half the length of a football field of dry ice. Based on previous examples (image below), the frosty avalanche likely kicked up clouds of dust when it reached the sandy surface. An avalanche on Mars captured by the HiRISE camera on the Mars Reconnaissance Orbiter on November 27, 2011. The dry ice avalanche caused a cascade in which large blocks of either regolith or rocks detached from the cliff. Credit: NASA/JPL/University of Arizona. Image cropped and edited by Nancy Atkinson. Carbon dioxide frost, which is basically dry ice, was first detected on Mars back in 2003 by researchers at the California Institute of Technology. Most of the ice on Mars’s polar caps consist of water ice, but dry ice forms a thin surface layer that thickens and thins seasonally. During this time of year, frost avalanches are fairly common. As the North Polar region warms, the resulting thermal expansion loosens and disrupts the carbon dioxide frost, triggering these sorts of exotic events.